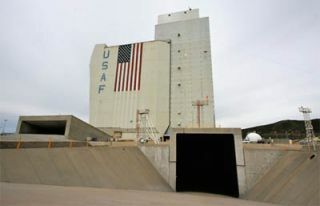 Within the enclosed confines of the massive Space Launch Complex 6 pad at the southern end of California's Vandenberg Air Force Base, a site once envisioned to fly the space shuttle, a Delta 4 rocket and its classified satellite cargo are undergoing final preps for blastoff next week. Liftoff is scheduled for Thursday, March 29 on the NROL-25 mission to deploy a hush-hush payload for the U.S. National Reconnaissance Office, the secretive government agency that designs and operates the country's fleet of orbiting spy satellites. Although the exact launch time hasn't been revealed, officials say the liftoff will happen sometime between 2 and 5:15 p.m. local time (5-8:15 p.m. EDT; 2100-0015 GMT). The launch will be the first of four that the NRO has planned this year, a batch of missions that also includes an Atlas 5 on June 20 and a Delta 4-Heavy on June 28, both from Cape Canaveral, and another Atlas 5 from Vandenberg on Aug. 2. "These successful launches are a very important and visible reminder of the space reconnaissance mission the NRO started over 50 years ago, and continues with such great success today. We are committed to smart acquisition investments and practices to ensure the continued coverage and availability of our vital national security systems and we work tirelessly to deliver these systems on time and within budget." Last year's remarkable launch surge used various types of Atlas and Delta rocketsto launch replacement satellites into virtually all of the NRO's networks of imaging, eavesdropping, surveillance and data-relay spacecraft, plus the small Minotaur booster lofted a research and development payload. "From launching and operating the most technically-capable systems to continued operations of legacy satellites the NRO remains the premier space reconnaissance organization in the world," said Sapp. The identities of the satellites going up this year are not disclosed to the public. But NRO Director Bruce Carlson recently said the upcoming deployments will refresh the agency's ability to continue guarding U.S. national security. "The launch of these systems will not only improve on the NRO's capabilities, they will also help reduce the overall age of our constellation and better deal with today's and tomorrow's global threats," he said. More often than not, the purpose of any NRO launch is the rejuvenation of the existing constellation by replacing an aging orbiting asset with a new satellite or bringing the next generation on line. That was the major achievement of last year's surge, which came as the NRO was celebrating its 50th anniversary. "Most aggressive launch schedule in 25 years and the satellites we launched were more complex and technically demanding than any we have launched before," Carlson said. "Through this campaign and the dedicated efforts of the NRO workforce, we proved once again that the NRO knows how to develop, acquire, launch, and operate our nation's intelligence collection satellite constellation and our worldwide coverage is as good as it has been in years." The average age of the NRO's satellites has been reduced thanks to the newest birds put on orbit, he added, while other spacecraft see their missions evolving from the original intent to face the current threats around the globe. "Majority of constellation is aging, but despite age of some satellites, still very robust, adaptable," he said. "Some designed to monitor Soviet communication in Northern Fleet are now used to geo-locate sensitive signals in the war zone." The towering vehicle will stand about 217 feet tall. This is the only version of the five Delta 4 configurations that hasn't been used in the program's 18 previous launches from Florida and California. The most recent launch in January flew a close comparison, but it had the maximum number of four strap-on boosters for extra thrust off the pad instead of just two needed for the NROL-25 mission. The payload's size likely drove the mission planners to pick a Delta 4 with the roomier nose cone size of five meters versus the other option of four meters in diameter. The rocket will soar away from Vandenberg leaving a smoky contrail that should be visible for miles around, heading over the Pacific towards an undisclosed orbital perch. Hobbyist satellite observers around the world will have their eyes on the sky looking to spot the new object and figure out which segment of the NRO constellation is was launched to fill. The mission logo for the planned March 29, 2012 launch of the National Reconnaissance Office's latest spy satellite NROL-25. It is widely understood that the NRO operates different types of satellites that include eavesdropping for intelligence-gathering, high-resolution imaging birds that collect exquisite pictures of ground targets, all-weather radar platforms to perform surveillance day and night, ship-tracking spacecraft, and the necessary communications craft to relay data from the lower-orbiting assets when they are flying outside the range of tracking stations. All of the information obtained is shared with analysts, policy makers and the warfighters in the global hotspots. "In 2011 alone, NRO provided extremely valuable intelligence supporting more than 15 operations to capture or kill high value targets in combat areas. In addition, NRO supported more than 120 tactical operations locating Improvised Explosive Devices, helping to prevent the most lethal attacks against our ground combat forces. These tactical support operations also included support to ground and air tactical actions; counter-terrorist actions; and maritime anti-piracy/interdiction. We also provided vital overhead support to 17 critical Combat Search and Rescue missions. In addition to ground combat operations support, NRO supported 33 Strait of Hormuz transits ensuring U.S. Naval Forces had the intelligence assistance needed for safe passage," Sapp said in open testimony to Congress. What's more, the NRO has sped up the turnaround time from the collection of information by the satellites to delivering that data to users like combatant commanders through new state-of-the-art systems. "Ongoing counter-insurgency and counter-terrorism activities have underscored the tremendous impact of these systems in support of combat operations throughout the Eastern Hemisphere," said Sapp. "NRO has responded with an accelerated fielding of these ground systems that can quickly support finding and alerting potential insurgent events and meeting United States Central Command (USCENTCOM) requirements for near-real-time situational awareness battlespace." The NRO spacecraft are considered to be some of the most sophisticated and technologically advanced in the world. But their exact capabilities, appearances and features are classified, with the public finding out only generally what they do. "The NRO is doing amazing things today. Our reconnaissance satellites are saving lives, protecting our nation from those who would do us harm and informing our national command authorities and policy makers," said Carlson. "In the past, the process had built-in delays. Days passed before intelligence community analysts could analyze imagery that we recovered from space. That has all changed. Today we are putting data into the hands of analysts, products into the hands of warfighters, and critical information into the hands of policy makers in time to make a difference." SpaceflightNow will provide complete coverage of next week's launch as the NRO's latest bird takes flight from the Central Coast of California.